Most of us here in the HEXUS labs are power users at heart. We always have been, and the majority of us still use full-size chassis crammed with the latest tech. But times are changing and we have to confess, we've taken a real liking to small-form-factor PCs. The time is right, we feel, for high-performance rigs to be delivered in small, quiet and elegant designs, and Apple's upcoming Mac Pro has, it seems, already set the benchmark. And so began our quest for the ultimate small-form-factor chassis. Lian Li's mini-ITX PC-Q27 was our first port of call, and though impressed by the chassis' quality workmanship and logical layout, we felt Lian Li needed to look past legacy components, such as optical disk drives, to deliver solutions that are smaller still. 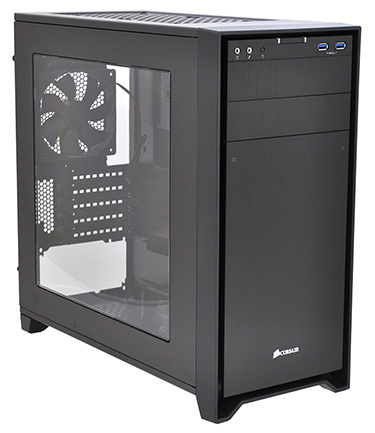 Up next, Corsair, whose £85 Obsidian Series 350D is "designed for building compact high-performance systems with Micro ATX and Mini ITX motherboards." 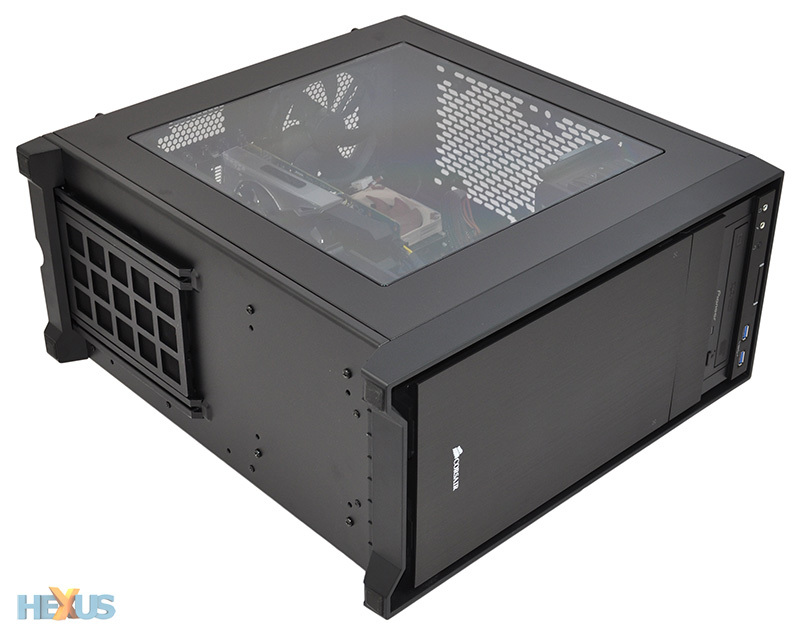 This is the first Corsair chassis not to support full-size ATX boards, so naturally, we're curious to see what the manufacturer of high-performance hardware does with a case that's supposed to be compact in size, or better yet, tucked away out of sight. Front 140mm and rear 120mm cooling fans. Room for up to five fans total. The answer? Well, Corsair being Corsair, the Obsidian Series 350D doesn't hold back. There's room for a couple of 240mm rads, mounting points for up-to five fans, enough expansion slots for two full-length graphics cards, two optical bays and five storage bays. Such is the scope of the chassis, compact probably isn't the word we'd use to describe it. 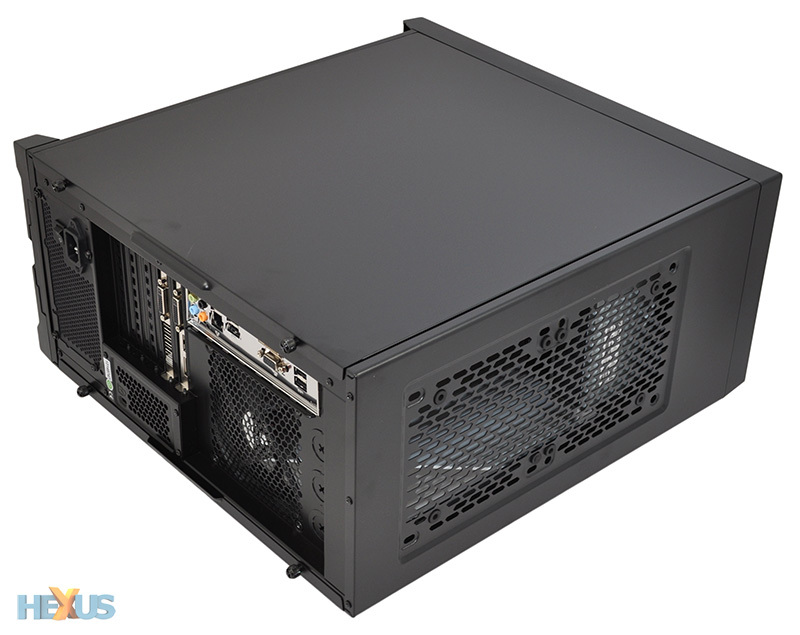 Standing at 440mm x 211mm x 450mm in size, the 350D is one of the largest micro-ATX chassis we've seen. Put it alongside Corsair's own Carbide Series 200R - which, we should add, supports full-sized ATX boards - and there'd be little in it as far as dimensions are concerned. Going small clearly wasn't the main priority. Corsair's goal, we imagine, is to provide micro-ATX users with maximum performance in an enclosure that, while ultimately still quite big, isn't too much of a chore to carry around. But the product's make-up does put the Obsidian Series 350D in an awkward middle-ground. 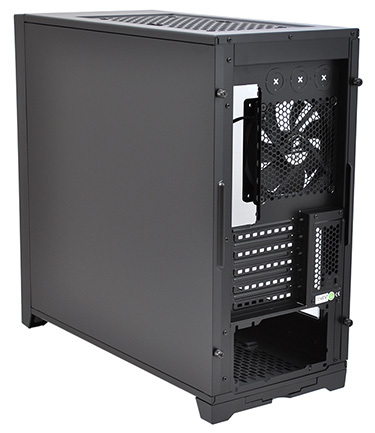 Given the small difference in size, there's always the chance performance users will lean toward chassis with full ATX support, and if you really want your next PC to be compact and portable, there are much smaller alternatives already on the market. What the 350D does have to its advantage, though, is Corsair pedigree throughout. Regular HEXUS readers may have noticed that the new 'baby' Obsidian borrows heavily from the aesthetic design of the gargantuan 900D. The same clean lines and all-black styling give the 350D a sleek appearance, while the floating brushed aluminium front fascia, that clips on and off like a speaker grill, still looks the business. We're also quite fond of the large side window, though Corsair does offer a windowless version for those who prefer to keep their hardware hidden. And if you're on a budget, it's worth noting there's a £10 discrepancy between the two; it's around £85 for the standard 350D, or £95 for the windowed model. This ultimately is far from being the smallest micro-ATX solution, but the specification alone has the ability to impress. So what's it like to use?